Mid 18th to mid 19th century. 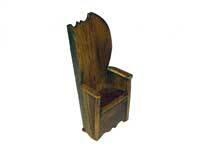 The primitive forerunner of the upholstered winged armchair. This type was particularly popular in the north of England. 18th century onwards. A low side table with an opening drawer and designed to fit against a wall. It had H-form stretchers in keeping with tables of this period. 17th century onwards. These boxes were used quite often to store the newly published Authorised Version of the Bible, which was found in almost every Stuart household. They could also be used to store important papers. A Bible box with Bible upon a low side table. Mid 18th century onwards. The top drawer and desktop are fixed upon two side pedestals of drawers (hence the alternative name of pedestal desk) with an opening in between to accommodate the legs when sitting (splat-back chair above suitable). Early 18th century onwards. Also known as a grandfather clock. The cases of country clocks were mostly oak with a square head and without much ornament. Early 30-hour clocks were wound up by pulling the chain of one weight within the central column. Later 8-day clocks were wound with a key. Mid 19th century onwards. A very popular clock that was hung from the wall and largely replaced the more expensive grandfather clock. They had 30-hour or 8-day movements and were weight driven. Most of them were exported from the New England states of America where they were one of the first examples of American mass production. 18th century onwards. 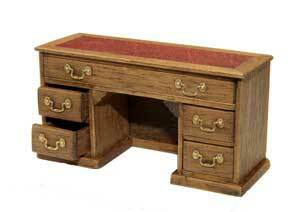 A desk made up of a chest of drawers below a sloping section that is enclosed by a drop-down hinged door. When the door is open it is supported by two lopers and forms a writing surface. The interior of the sloping desk is fitted with pigeon holes to the rear. 18th century onwards. A bureau as above but with a bookcase or cupboard above. The bookcase has two shelves and is enclosed by opening wooden doors. 18th century onwards. The splat-back chair has a ‘leather’ seat in either red or green. State which when ordering.